Last night (Saturday) was a scheduled open house at the observatory. The weather (cloud cover) was extremely doubtful but there was enough clear sky that I felt I had to make the drive out and open the dome. Good thing I did! All told about 12 visitors stopped by over the evening with the last leaving after 11 PM — they were the same two ladies who showed up as my first visitors at about 9:30! We had surprisingly good views of Jupiter considering sky conditions but a long wait for the Moon to climb out from behind the neighbor's trees. When Luna finally rose high enough we had to wait for breaks in the clouds — most people seemed to think the wait was worth it. Views at around 100X weren't very special so I switched to a low-power, fist-sized antique eyepiece and the entire view was changed. We could see the entire nearly-full Moon in the field of view with good detail overall and excellent seeing of the terminator. Even thin clouds scudding across the lunar disk seemed to add, rather than detract. So not too bad a night. My Moon photo apparently was published in Ravenna's Record-Courier… I've gotta try and get a copy! Today we took a very nice, somewhat challenging, great circle route between Valley City and Medina. Some hills, though not bad. Mostly good roads, nice scenery, and enough wind to help with cooling (it was hot and muggy) made for an overall pleasant experience. Total distance = 30 miles. Not like the long rides of the old days but it's the ride, not the distance, that matters most to us. Some soreness in the neck and shoulders, a bit of tinnitus, but not as bad as last week. Surprising sight along the way (sorry: no photo)… we were riding along and saw a white bicycle standing up against a saw horse in someone's front yard. The bike was for sale and, straining to see the make, I expected it would be an old Schwinn, Sears, or possibly a classic steel bike. Nope. It was a Kestrel! We could hardly believe it… a high-end bike like that cable-locked to a sawhorse on a country front yard! I haven't mentioned it in this blog but my sweetie bought me (with family money) a very nice present. A beautiful new Trek 2200 (2006 model) now carries me on our little jaunts. The purchase actually surprised both of us. We were visiting a bike shop and I was idly examining bikes when the owner, a person we know, said "what size bike do you ride?" I told him and he said, "here, you've got to see this!" 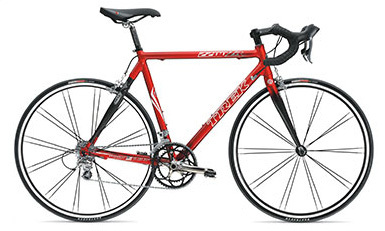 It was a beautiful, "candy red" Trek 2200 bike made from lightweight aluminum and carbon fiber with the Bontrager name all over the wheels, fork, and even the tires. A quick test ride (inside the shop!) showed it was a very good fit and we actually went home with it in the back of our car! Surprised the heck out of both of us as we aren't used to making impulse buys of that size. Still, it was being offered at a genuine 50 percent off the original price. I put my SpeedPlay pedals on the thing, adjusted the seat height and tilt a little and it is as close to perfection for me as can be! I can even pedal whilst in the drops and I've always had problems with that. I really love riding the thing but never thought I'd be blessed with such a machine — me, an old steel frame roadie. Now I've got to figure out when I'll ride the Specialized Allez we picked up a few years ago, charmed by the beauty of its simple lug work. It may not be so hard a decision as I expect, however, since the Trek is, again, so close to perfection. Tomorrow I get to work on a firewall issue. A little firewall device, purchased to protect the compromised server against future assault, is doing a great job — it shuts off all incoming traffic. That's pretty effective protection but not so good when you want people to be able to use the server. Just learned tonight, after Googling the issue description, that the NetGear FVS114 firewall router is known for this "lock up" behavior. There's no solution, either. Drat! Well, at least now I know. This was a surprise since I've had really good past experience with the company's small routers. I'll probably have to buy a much more expensive device just to provide the reliability the NetGear is lacking. It's always something.